Academy Award Winner Adele at the Oscars! The Oscars... Adele couldn't have picked a grander scene for her first live performance of "Skyfall," the title track from the latest Bond film. About 30 minutes before winning best original song on Sunday, the British dynamo led a large scale run of the track. With hair down and gold sequined black dress shimmering, Adele did her trademark stand-and-sway and this-big hand gestures as a full chorus and massive backing band (complete with a 15-plus orchestra) brought the layered, building track home. After, she smiled and gazed at the upper tier of the Hollywood & Highland Center as Hollywood's a-list applauded (but no standing "o"). The performance could boost sales of the song, which peaked at No. 8 on the Hot 100 and has sold 1.6 million downloads, according to Nielsen SoundScan. Earlier in the night, an ageless Shirley Bassey (76) sang another Bond title track that peaked at No. 8, the 1964 classic "Goldfinger," during a tribute to the 51-year-old film series. Here's a bit of advice for all you awards show handicappers: Never, ever pick against Adele. If the British pop singer is up for an honor -- any honor -- chances are, she's taking home the trophy. "Skyfall," Adele's aching, dramatic theme from the acclaimed James Bond movie of the same name, won the Oscar for Best Original Song. Oscar voters agreed with the judgment of the Golden Globes, where Adele also took the award for the best new song in a movie. Adele faced stiffer competition at the Golden Globes. To win that honor, she had to beat Taylor Swift, Jon Bon Jovi, and other popular singers. Her Academy Award competition was, by contrast, middle-of-the-road and unexciting: "Before My Time" from the climate-change documentary "Chasing Ice," "Everybody Needs a Best Friend" from the crude "Ted," "Pi's Lullaby" from the surreal "Life of Pi," and "Suddenly," from the beloved musical "Les Miserables." The Bond franchise is rightfully known for its excellent music, much of it composed by the conductor John Barry. Surprisingly. "Skyfall," which was written by Adele and her producer and collaborator Paul Epworth, is the first Bond song to ever take the Oscar in this category. None of the signature songs from the Sean Connery movies -- including the classics "Goldfinger" and "Diamonds Are Forever" -- were even nominated for the award. "Live and Let Die," Paul McCartney's wonderfully bombastic theme song from Roger Moore's first turn as Bond, earned a nomination in 1973, but lost the award to the treacly "The Way We Were." In a similar contest, Carly Simon's "Nobody Does it Better," the hit from "The Spy Who Loved Me," lost to Debby Boone's "You Light Up My Life." "For Your Eyes Only," Sheena Easton's atmospheric theme from the Bond film of the same name, was beaten by Christopher Cross' blithe "Arthur's Theme." Adele scored at the 2013 Grammy Awards, too, and nobody seemed more surprised than she did. After dominating the 2012 Grammys, she probably felt it was time to give somebody else a chance. Instead, she took home another statue for Best Pop Solo Performance for her live version of "Set Fire to the Rain." 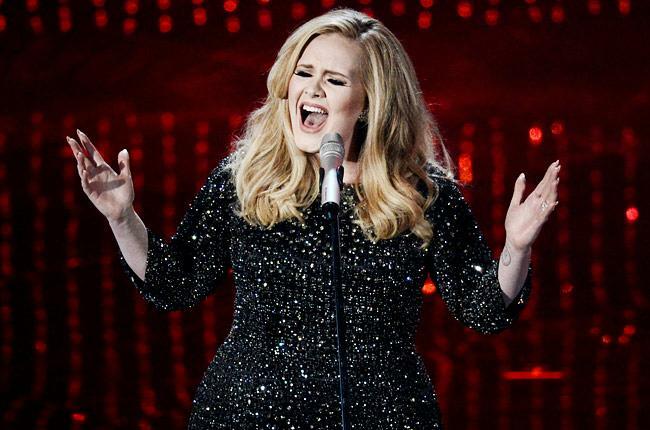 Still only 24 years old, Adele Adkins has emerged as one of the premiere pop singers of the last ten years. "21," her 2011 release, has sold over 25 million copies worldwide, and spun off three massive hits -- "Rain," the slow piano ballad "Someone Like You," and the smoldering "Rolling in the Deep."